We recently put together a training video called Door Ambush. We created it because there is a huge hole in the industry as far as preparing your home and training for counter attacks at the door is concerned. There is just not much out there, not that we've found at least, dedicated to teaching you the fundamentals of protecting yourself from start to finish when concerning the front door … where a good portion of break-ins happen. And when I say “start to finish” what I mean is the time before an attack happens, to how to open the door to people making deliveries, to actually shooting back at someone who forcefully entered your home. Speaking of shooting back, that's usually the only thing folks think about, and I think I know why that is. Most people willing to defend their castle only think about the shooting back part, and not the fortification you can do beforehand to prevent the actual break-in from happening because nobody told them to think about it. Remember, we haven't found one resource that covers it all in detail. Every 14.6 seconds another American home is violated and invaded AND most ‘successful’ invasions begin with some kind of door ambush. Every 2 minutes in the United States, a home robbery turns into a violent crime against a homeowner. 58% of home invasions used some type of forcible entry. The odds of being a victim of a home burglary are only 1 in 34. That last one is shocking. Are you prepared for a burglary with only a 1 in 34 chance? I wasn't prepared so I watched the video and I'm glad I did because I actually learned a few things, even though I've been working for this industry for quite a few years. Granted, there is a higher chance of a home break in if you live closer to a big city than out in the rural areas of our country, but it can, and does, happen anywhere. When we came up empty handed in our search to find and promote a good training product on home defense, the only logical option was for us to make one ourselves. 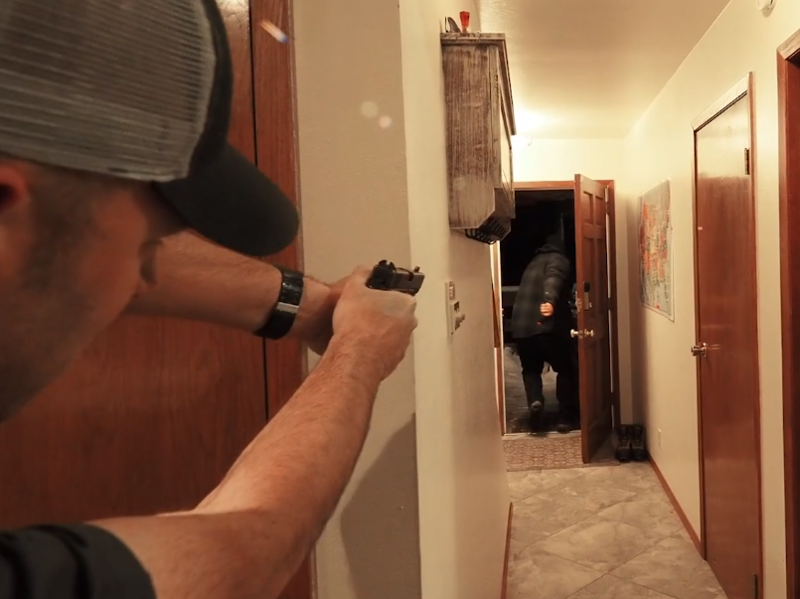 So, we went up to the mountains, rented a home to film in, dressed our social media guy up as a criminal for our scenarios, and then filmed every aspect of it.